The seven-week-old puppies made their debut at the dog unit in Sandon when they were paired with volunteers who will look after them until they begin training to become police dogs. 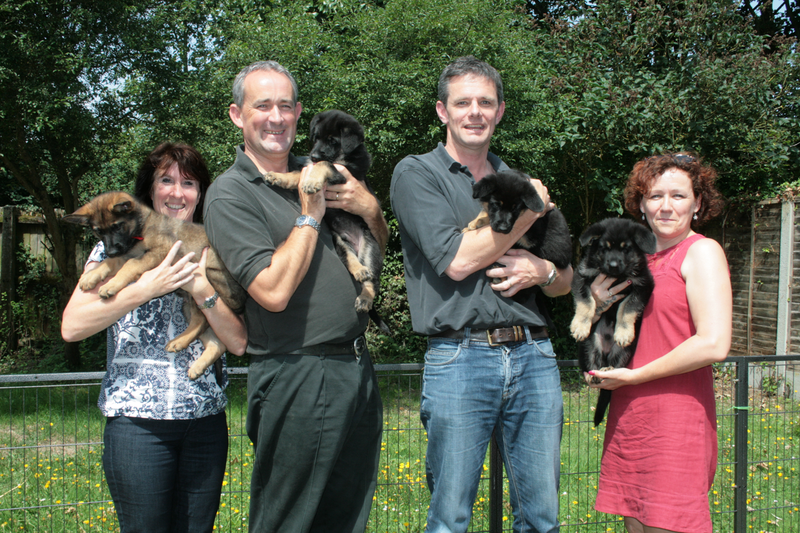 The German Shepherd puppies were born on June 3, 2014 after Essex Police’s dog Xena was bred with a male dog from a private breeder. The playful pups, who are Xena’s second litter, have been given names beginning with the letter ‘T’ after PC Terry Collinson – one of the police dog instructors who has been taking care of them. Each of the puppies has been paired with a volunteer known as a puppy walker. They are members of the public who give up their time to help prepare the dogs for training by getting them used to as many environments as possible. They don’t train the pups but introduce them to as many different people and places as possible from noisy train stations to crowded shopping centres so they become familiar with everything they might encounter in their working career. In just over a year, when the puppies are around 14 months old, they’ll leave the puppy walkers to be teamed with a PC handler. Together they’ll take on a demanding 13-week training course, during which they’ll learn to work as a team to track, search and detain potential suspects. If they make the grade they’ll be operational on the streets of Essex for 2016. PC Terry Collinson describes how the volunteers are a crucial part of the process of introducing the puppies to people, noises and unfamiliar surroundings. Puppy walkers Sue and Guy describe why they got involved and how they are looking forward to taking Tia and Tyson home with them for the first time. Thank you for posting this. Are the puppies now fully trained members of the police force?